This week I’ve been writing about the power of our words as preachers. Not only can we re-present the Scriptures as we explain and apply, but we can undo the Scriptures as we carelessly overqualify, say too much, or say that which is unhelpful. They say driving a car is like having a 1.5 tonne bullet with the trigger under our right foot. What, then, is preaching a sermon? 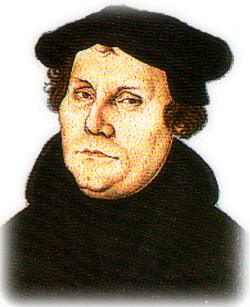 Luther was astonished how many Christian theologies accepted the basic scheme of the law and its morality (opinio legis), but had nothing worthwhile to say about Christ. . . .
Down comes Christendom, with a word! Preaching is democratized, not in the sense of emerging from the people but of being available to them all equally – in an instant, rich and poor, male and female, circumcised and uncircumcised, German and Italian. With this the pinnacle of power lay not in Rome or with kings, but at the point of the delivery of a sermon.